This is probably my favourite dessert ever. I love my grandma’s apple pie, I really haven’t met many desserts I don’t like…but this I will say is my favourite. My Grandma T used to make it and I suddenly remembered about it again in the last couple of years, and luckily my mom had the recipe around! 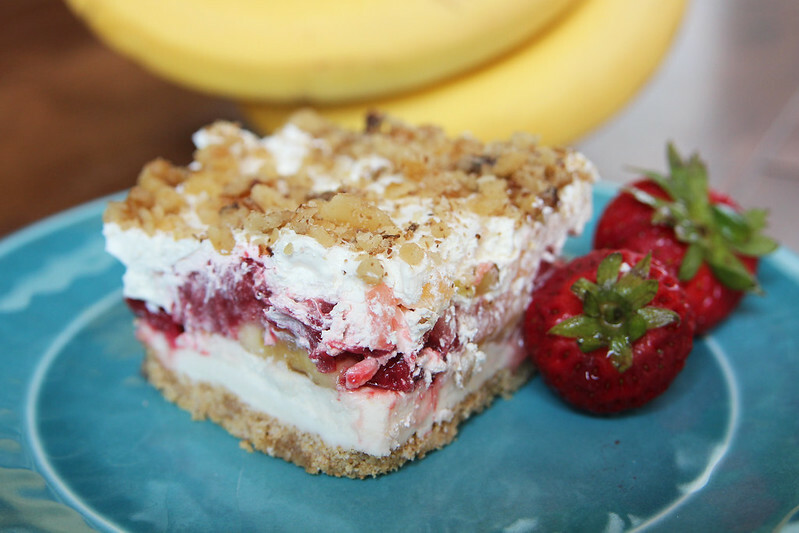 It is a refreshing, perfect summer dessert…but I don’t see the harm in eating it year-round! Combine these ingredients for the first layer in a 9×13 pan and chill for 1 hour. For the second layer, cream the icing sugar and butter together; add the liquid egg and vanilla and mix well. Spread over the crumb layer and chill another hour. Note: my grandma’s original recipe called for 1 egg—a raw egg—that never gets cooked. Back in her day raw eggs didn’t pose a health risk, now there is risk for salmonella. Use a raw egg if that’s your thing, or safely use a liquid egg or other egg replacer of your choice. Eggs.ca recommends, if you are going to use raw egg, to wash the egg in hot, soapy water and refrigerate immediately after preparation, until served, and keep it cold while serving; discard leftovers same day. I did read that you can pasteurize your own eggs by placing the egg in 60°C or 140°F water for 3 minutes, but I can’t find science to back that up. They say the water is not hot enough to cook the eggs, but is hot enough to kill bacteria. Slice bananas and place on icing sugar layer, spread the strawberries over the bananas and then the pineapples over the strawberries. No need to wait another hour, spread the Cool Whip (you can use whipping cream, but there’s just something about Cool Whip and this dessert — I recommend sticking with Cool Whip) on fruit layers and sprinkle top with walnuts. Chill until ready to use, the longer, the better. If you eat too soon, it will still taste good but the crust will likely crumble. It’s much better as a second day dessert and remember to keep refrigerated! Combine the ingredients for the first layer in a 9x13 pan and chill for 1 hour. For the second layer, cream the icing sugar and butter together; add the egg and vanilla and mix well. Spread over the crumb layer and chill another hour. Spread the Cool Whip on fruit layers and sprinkle top with walnuts. Chill until ready to use, the longer, the better. Note: my grandma's original recipe called for 1 egg---a raw egg---that never gets cooked. Back in her day raw eggs didn't pose a health risk, now there is risk for salmonella. Use a raw egg if that's your thing, or safely use a liquid egg or other egg replacer. I really hope you enjoy this, it will always remind me of my sweet grandma! 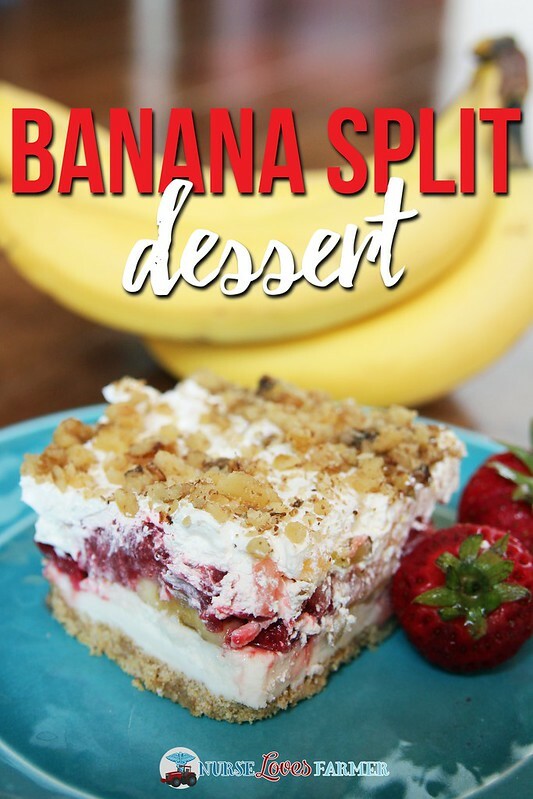 This is a GREAT dessert for a potluck! Disclaimer: Eat raw eggs at your own risk, use your own judgment! « Jonathan is 11 Months Old! Ill have to sub out that second Lauer entirely for a softened vegan ice cream and fresh fruit vs frozen, But this is a clever idea. You need the frozen strawberries to retain sweetness and a bit of moisture. You can sub for fresh, but it won't taste nearly as good, in my opinion. Oh this looks sooooo good, Sarah! This is going to be made! Yum! What about food safety? The egg in your recipe isnt cooked, chance of salmonella. Maybe I will try it using a pasteurized egg, now to find out where to buy one lol. Thanks.